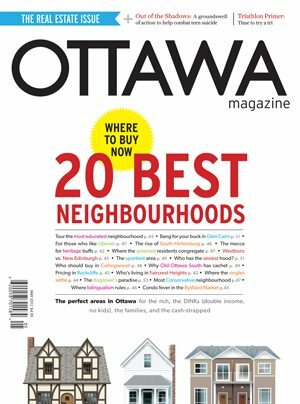 The best neighbourhood in Ottawa is…. I can guarantee that if I ask 20 people right now, each will give me a different answer. Where we choose to live is a very personal decision. In other words, it’s impossible to come up with an objective response. When I bought my current house, I was looking for proximity to green space and a solid neighbourhood school. You might be looking for a condo within walking distance of great restaurants and public transit. But though the term “best neighbourhood” is completely subjective, there is value in looking at Ottawa’s neighbourhoods through the data that’s out there. Analyzing the mountains of available stats can tell us everything from how much we’ll pay for a single house in our desired area to whether our neighbours are likely to be Conservative, Liberal, or NDP voters. Writer Laura Byrne Paquet does a brilliant job of crunching the numbers to recommend the top five neighbourhoods for four types of buyers: those for whom cost is no issue, double income no kids, families, and the cash-strapped. She’s backed up by photographer Dwayne Brown, who captured the essence of the top ’hoods, and by Amanda Shendruk, who took some of the fun and obscure statistics we discovered and turned them into infographics. I love the list. How about you? Let the debate begin. A groundswell of action to combat teen suicide started with the death of Daron Richardson in November of 2010. Her parents quickly teamed up with The Royal to launch the high-profile Do It For Daron (D.I.F.D.) campaign aimed at getting teens — and all of us — to speak openly about mental health. Journalist Moira Farr talks to the health-care professionals on the frontlines about the overwhelming need in our community. She then gets to the heart of the matter, interviewing teen mental health activist Hannah Brunsdon about how terrifying it was to have to wait for help as she suffered with depression and how she thinks the system should change. Farr tackles a hugely complicated issue in a manner that’s both respectful and compelling. Required reading for everyone in the city. COMING UP: Sweet summertime. It’s coming up fast, and we’re already hard at work researching fantastic warm-weather road trips and adventures and interviewing locals whose jobs and hobbies epitomize the joy of summer. As well, because we hope you’ll find yourself lounging on a hammock or by the pool, we’ll definitely include a short story, penned exclusively for Ottawa Magazine.